This week I presented at Pecha Kucha 13 at the Seahorse and the audience was very much full of Dalhousie Planners and creatives who care about urban design. I got a lot of compliments on the density maps that I used in my presentation (it was that kind of crowd!). None other than Peter Dykhuis complimented me on the maps, which was a huge compliment. Trouble is they are not my maps! They were created by my friend Zack Taylor, University of Toronto and Metapolis Consulting. He knocks out GIS maps for fun and I was pleased to take him up on his offer to do this for me! His take on the interest was “they are flawed of course — they don’t show lakes and the end of Bedford Basin doesn’t seem to be there. Anyway, if you think they are “good enough” then make the most of them!”. I also want to send a shout out to Michael Steeleworthy and his inspired work with doing similar maps on his website The Zeds with the 2006 data. So with this qualified blessing, please enjoy these maps. 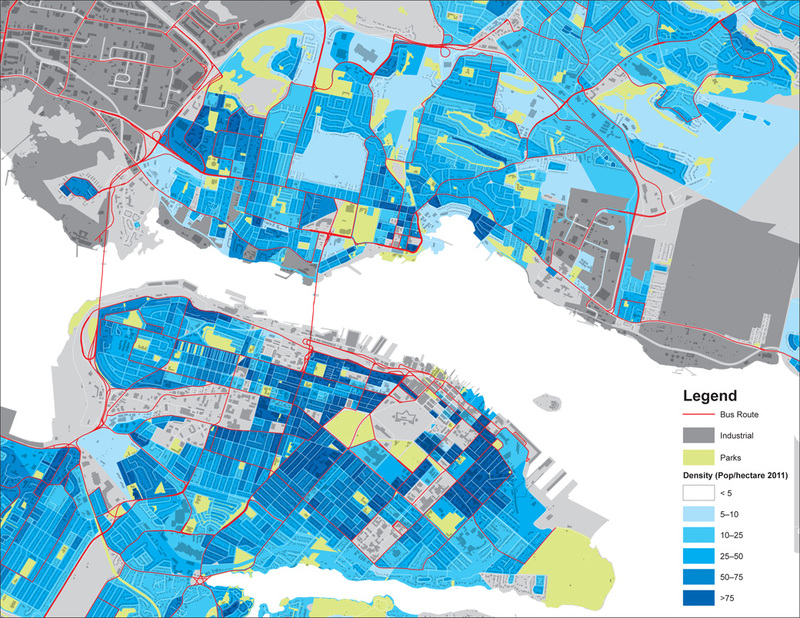 There are 4 largish PDFs, Halifax Density Zoom with Buildings, Medium, Core, and Big Picture. Just make sure you credit Zack!